This wonderful new album offers fast-sequenced electro dance grooves and highly catchy pop vox clashing onto powerful electric guitar riffs ("Tetrachromatic", the floorkiller "Kamikaze Angel", the NEW ORDER-ish and almost romantic "Beyond" or yet the album title song "Nyctophilia"); but also kind of timeless pop wave tunes with a modern dynamic touch evoking classic acts like CLAN OF XYMOX, THE CURE, GARY NUMAN or yet DEPECHE MODE ("Unleash The Wolves", "Breathless" and its addictive synth melodic lines, the darkwave goth pop "Run Away (With My Demons)" or yet the oppressive gothic rock anthem "When It Is Not Black Enough"). All beautiful songs on which Noemi's voice evokes similarities with good old GHOST DANCE, SKELETAL FAMILY, SIOUXSIE, but also GARBAGE and other WITHIN TERMPTATION. Last but not least, HELALYN FLOWERS also stand for more upfront raging industrial metal moments with impressive adrenaline pumping revolted vocal assaults ("Let Me In" and the edgy and almost self-destructive cyber pop rock of "Morphine"). 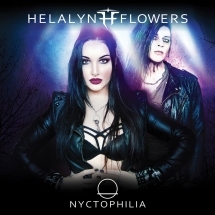 With "Nyctophilia", the alluring Italian duo offer us an escape from our basic down-to-Earth lifestyle towards the exciting darkside of the world where we acquire a deeper confidence with our own personal demons and turn them into sources of inspiration feeding our creative flow. HELALYN FLOWERS' new album has absolutely all the ingredients to apply for becoming one of the best electro pop rock albums of the year 2018! Play it loud and without any moderation!